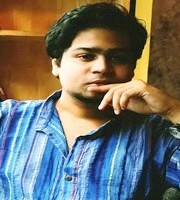 Tejasvi Saxena is a bilingual poet and writer, thinker and a photography enthusiast from New Delhi, India. His areas of interest include Art, Culture, Nature, Music, Spirituality, Sociology, Books and Writing. His poetry has been published in Muse India, Visual Verse (Germany / UK), Duane’s Poe Tree, Indian Periodical, Dissident Voice (US), Tuck Magazine (Canada) and is forthcoming in Spillwords (Poland) and Scarlet Leaf Review (Canada).